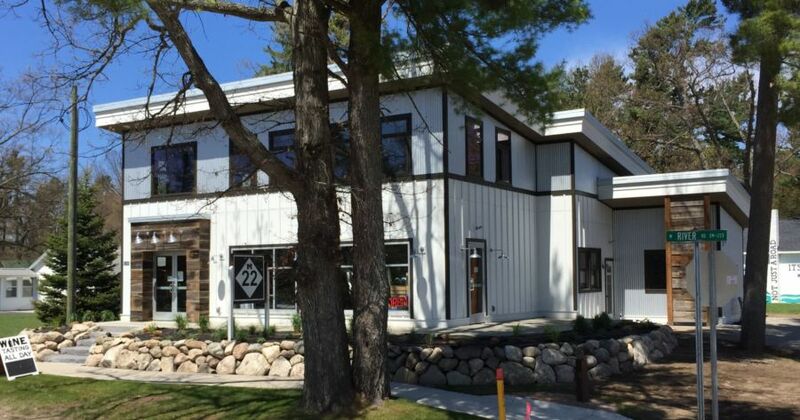 GLEN ARBOR: The Crystal River Outfitters Recreational District announces the re-opening of their M22 Glen Arbor store. M22 Glen Arbor, owned by Katy & Matt Wiesen, originally opened its doors in the summer of 2005. For the past 4 years, it sold the M22 and Love Michigan clothing & accessory lines, plus was the exclusive sales outlet for M22 wine tasting and purchases. The Wiesens soon realized that more space was needed to accommodate the growing product line that the M22 and Love Michigan brands offer. Local architect Andy Rink of A. Rink Architects drew the designs per Wiesen’s requests, which provided a modern feel with rustic characteristics to fit into Glen Arbor and the Sleeping Bear Dunes National Lakeshore. The Wiesens hired local builder Cooley Contracting. The team was made well aware of the tight timeline for reconstruction. “We didn’t want to miss out on the Christmas holiday sales, but also wanted to be open again by early May for when the summer season starts to kick back in. Cooley got to work the 2nd week in January and we were able to get back in the building by May 9. It was truly impressive!” said Matt Wiesen. The new space will feature almost twice the square footage of the old store, plus more space for wine tasting. The upstairs will house offices and a meeting room for the managers of the Crystal River Outfitters Recreational District. In the store, shoppers will be able to shop the full line of classic M22 & Love Michigan hoodies, t-shirts, sweatshirts, stickers and more, plus many new designs created by M22, LLC.’s new graphic designer. Shoppers can also taste and purchase the fourteen M22 custom blended wines at the M22 Wine Tasting Bar. All M22 wines are produced by Black Star Farms using all local grapes and cherries. M22 Glen Arbor is open year-round. The Crystal River Outfitters Recreational District consists of Crystal River Outfitters, The Cyclery & M22 Glen Arbor. Crystal River Outfitters offers kayak, canoe and stand-up paddleboard rentals, plus clothing, footwear and swimwear. The Cyclery bike rentals, service/repairs and sales of new bikes and gear. M22 Glen Arbor features the full line of M22 and Love Michigan clothing and accessories, plus M22 wine. M22 Glen Arbor is a licensed store through M22, LLC. Road trip with M22, the story of how it all got started.